INSPIRE’s “Wear All Blue” Colorectal Cancer Awareness – DAY 5 with the Department of Youth and Women Affairs (DYWA)! 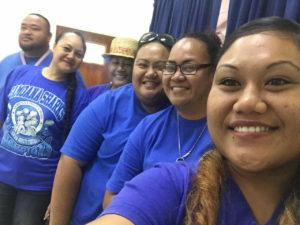 Youth Program Coordinator, Paulia Pa’o-Pelenato sends “wear blue” pictures of their department’s fabulous staff. 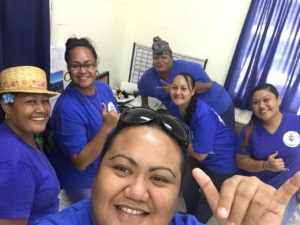 DYWA’s mission is to plan, design, implement, and evaluate educational programs, training seminars, cultural programs, and information networks to empower the youth and women of American Samoa. Act as a liaison between resources and to be a clearing-house for data, research information, and existing programs. Visit their Facebook page at https://www.facebook.com/asdyws/ to find out about their programs. 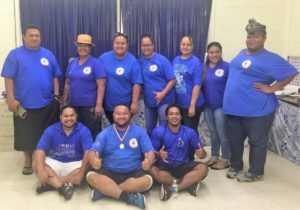 Thank you Director Jonathan Fanene and Deputy Director Pa’u Roy Ausage in supporting the American Samoa Community Cancer Coalition in helping the people of American Samoa fight cancer.